After seeing it, I would say the Muppets movie is less of a movie, and more of a feeling. Not that it doesn’t have a plot – it has a solid (albeit predictable) plot, with suspense and buildup and characters and a climax and everything. It’s just that when you combine the bright colours, the music, the smiles, the nostalgia, and all those familiar puppet faces… it blends into a kind of haze of felicity that bubbles around in your head afterwards with no need for linear structure. As of today, The Muppets is at 97% on Rotten Tomatoes. You don’t see that very often. I don’t think I was as blown away by it as those whose input makes up that 97%, but I did find it pretty delightful. I enjoy that they never explain how Gary has a Muppet for a brother. You just have to go along with it. I enjoy that Mary is some kind of mechanical/electrical whiz. Kermit’s new voice is admirably close to the old [real] one (though not quite the same). Walter’s talent (no spoiling) = darn COOL. When I heard the “Man or Muppet” song, I accurately called (not yet knowing) that it was Bret McKenzie’s composition. It’s got that Flight of the Conchords sound. The song is even better with intricate, old-school, jaunting-along-the-street choreography. I wasn’t an actual Muppet aficionado as a kid (though I did think Beaker was pretty funny); I’d probably have fallen more vigourously in love with this film if I had been. Sesame Street was more my thing, so my softest spot is for Kermit. Still, it really is affecting to hear the Muppet Show theme again, and to see all those Muppets back in fine form, especially the ones I’d forgotten existed. Like those trippy musicians, and the big floppy hairy brown guy. Makes you wonder where they were all these years (literally, like in whose attic). I ruefully admit that I cried full-on tears when Kermit and Miss Piggy sang “The Rainbow Connection”. I can’t even really tell you why. I just think it’s one of the prettiest melodies ever, with its deceptively simple, kinda profound lyrics. Also, I’ve been singing it to E at bedtime practically since he was born. Lovelovelove. As I said to Sean when it was over, I get a kick out of the self-fulfilling prophecy of it. 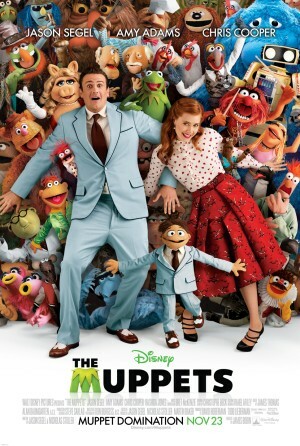 I guess Jason Segel & Co. just really missed those Muppets and knew they had the power to bring them back for real. And they’re totally worth bringing back. 2) Bret is so hot, he’s making me sexist. He’s like a curry. 3) I didn’t know that you were not a Muppets fan! Though I don’t know even quite what that means. Was I a Muppets fan? I watched it a lot, because it was on a lot and was great. I think even into my adult years maybe. And I went to see The Great Muppet Caper in the theatre and it was all things beautiful and exciting and adventurous. And there was this record that I got from the library, and/or Alix had it in her possession, that was Muppet songs, and from it I learned America The Beautiful (or is that some messed-up not-real memory?) and The Rainbow Connection. Which totally still makes me cry. I was really glad to hear that a new Muppet movie was in the works…I watched regularly as a kid. 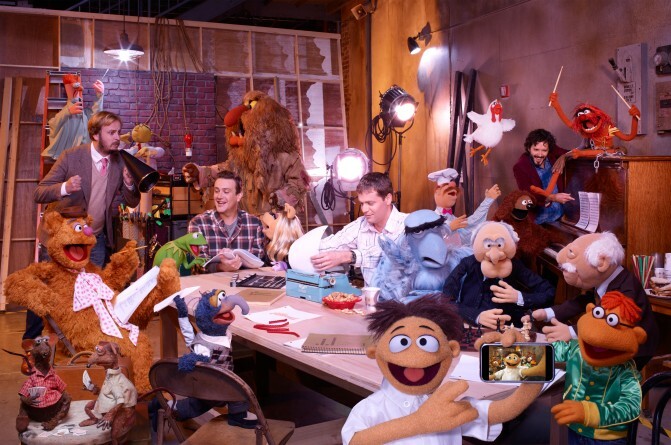 Em, you should look up Jason Segel’s interview on Strombo…it’s a lot of fun and explains the puppet musical. I finally was in a quiet place and could watch the videos. I notice that in the movie version, they mostly just dismiss the whole issue of the range being too low by not singing the tune at all! haha. bc it did sound like Brit and Kermie were having some trouble with the low notes, I think. Also i thought that Brit was just flubbing that line after “fish” but it’s that way in the movie too, aww. Very Cute.